finally the last week before Christmas has arrived and I tell you what I AM A LAZY BUM! I seem to have lost all my motivation and I really really don’t care. Maybe it’s because of these last three month being a tad stressful and intensive. I worked yesterday including a work brunch and a christmas party in the afternoon 😉 and I am not sure if I will make it back to the office this week. The beauty of being able to work from home! It all began me feeling a little unwell Sunday evening and I spontaneously decided to call in off sick Monday morning. Best choice ever. As it would have been a little strange to run from work brunch to office party taking photos of every tiny bit and piece that found its way to my mouth I decided to make it a What I ate Monday instead. It was a brilliant choice! I tried to make my meals extra pretty and you all know how much impact a pretty dish really has. I had a fabulous day! When I woke up in the morning I felt well rested and way better than the evening before. The cold was still draining my energy from me so I decided to stay in my pajamas. I took my blanket with me on the couch and cuddled up again for a few minutes of rest. When my stomach started growling I got up to make me some breakfast. Banana Pancakes it was. Because I still was too lazy to make an effort I ditched then pan in favor of the microwave. They turned out very delicious! 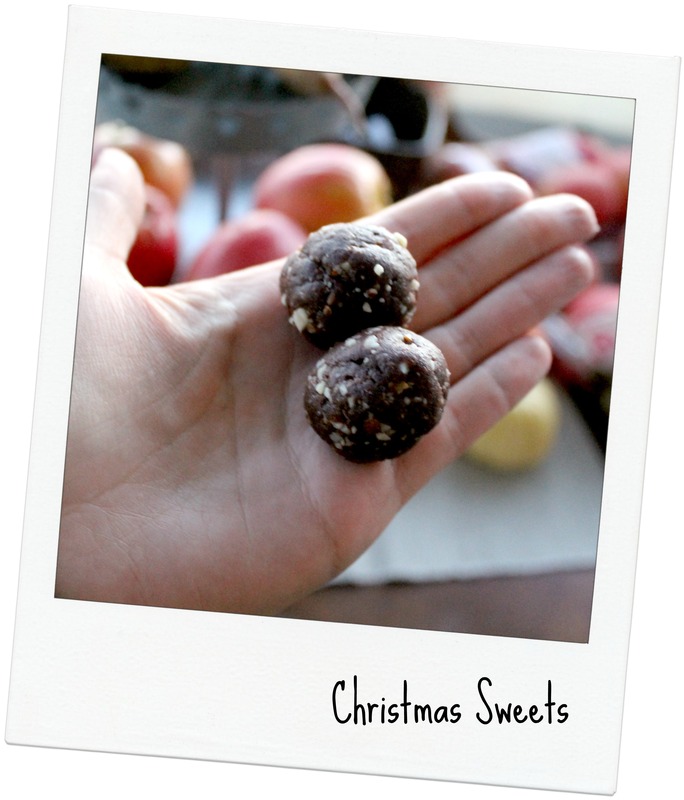 I drizzled some peanut butter and sprinkled some shredded coconut and christmas sweets dough on the. I enjoyed along with a cup of coffee. What a fabulous start to the day! My mother-in-law always thinks we are starving. This year I finally put my foot down and enforced that I don’t want to get an advent calendar stuffed with 10 pounds of chocolate. So now she thinks I must be eating disordered and tries to fill up my plate with other food in order to prevent me from starving! Do I have to mention that I ate an entire stollen in the course of three weeks? Yes, several times – doesn’t count obviously 😉 But jokes aside, she treated me with a 300g Steak on Sunday night and I only made it through 150g. So I had some Steak leftovers and was thrilled. First 50g of Steak went into my mid-morning snack: a veggie and steak stripes filled wrap with Nando’s Piri-Piri Sauce! So darn good! 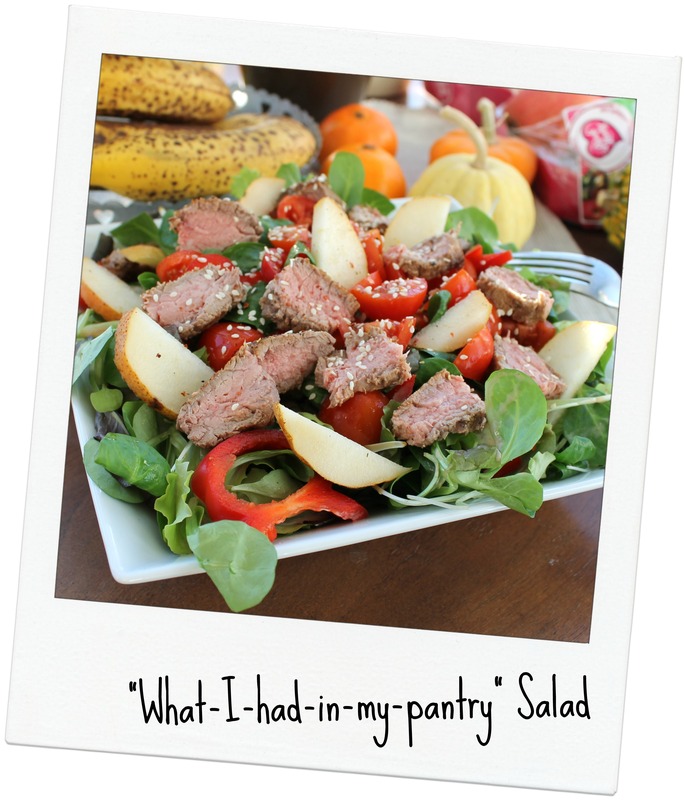 So for lunch I centered my dish around the remaining 100g Steak stripes and created a huge “What-I-had-in-my-pantry” Salad. There were leafy greens, bell pepper, tomatoes and 1/2 pear. I made a dressing from Piri-Piri Sauce and sprinkled some sesame seed on it. I loved every single bite! After lunch it was finally time to get some stuff done. I cooked some meals in advance, baked a banana bread for my work brunch and basically started with cleaning the appartment for christmas. Some laundry was also included. 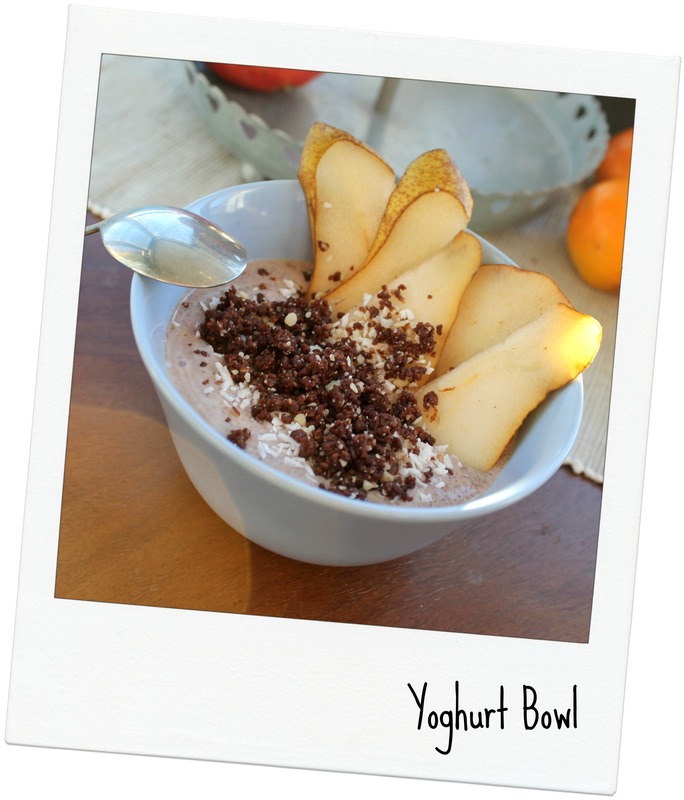 Later on I felt a food craving creeping up (I was not hungry at all but I gave in the craving) I made me a yoghurt bowl with cocoa powder, the remaining half pear, some shredded coconut and some christmas sweets dough. Pure deliciousness! When my husband came home we put up the Christmas tree and decorated the apartment a little bit. Then we went to the supermarket and bought a few things. When we came home we were both not in the mood for cooking and quickly agreed that it was time for junk food! My husband drove to the take-away and treated us to a nice and unfortunately not as hot as I had wished for Dürüm Döner. When it comes to junk food cravings definitely one of the best ideas! Later on I might have sneaked in the kitchen and might have looked for sweets. And it also might have happened that some Christmas Sweets might have found the way to my mouth as well 😉 What can I say I loved everything I ate on Monday! Totally share-worthy! So for now I am heading off to the gym. I will go directly to Munich afterwards for the hopefully last Christmas shopping this year. Tonight I have my last PhD Colloquium for this year and then I am off duty 😉 Maybe I’ll catch up with some work on Friday but I am still not sure about that! Holy moly only six days left till Christmas! I am so looking forward to the holidays! Are you already in a festive mood? Mhmm all of your eats look delicious! 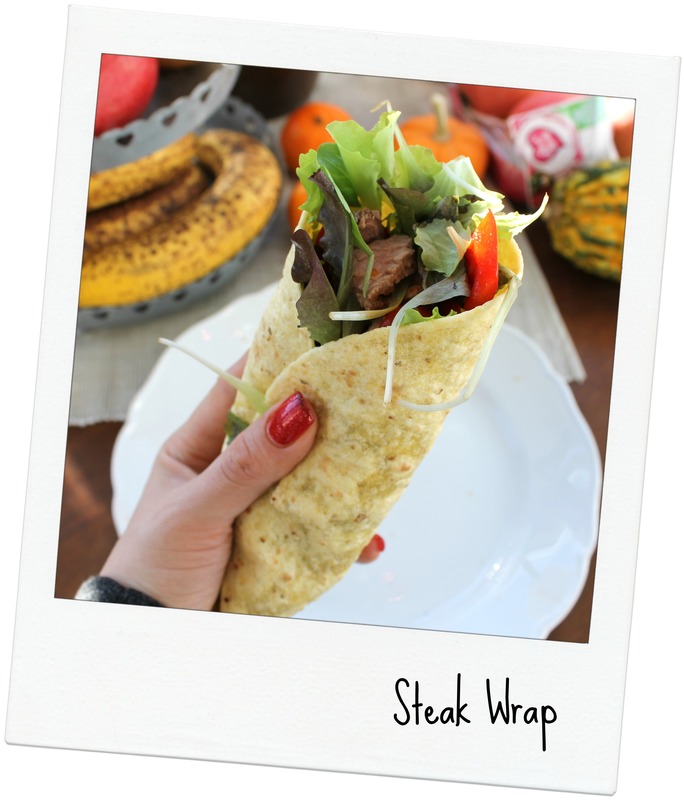 I love the idea of using leftover steak in a wrap. I always just eat mine plain, but that seems much tastier! Your yogurt bowl looks delicious. Have a great day! 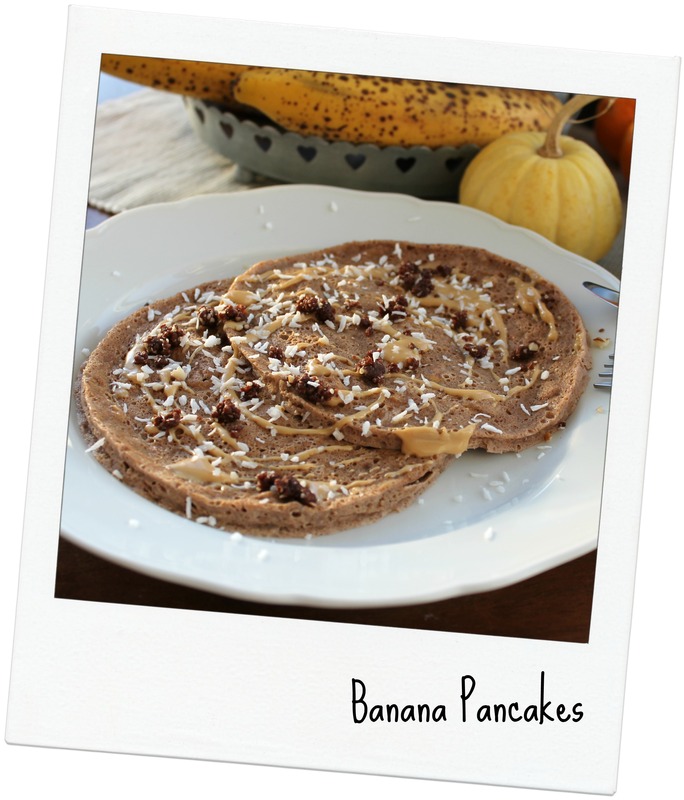 How I’ve never tried microwaving pancakes before I don’t know – that’s breakfast tomorrow sorted! Yum! 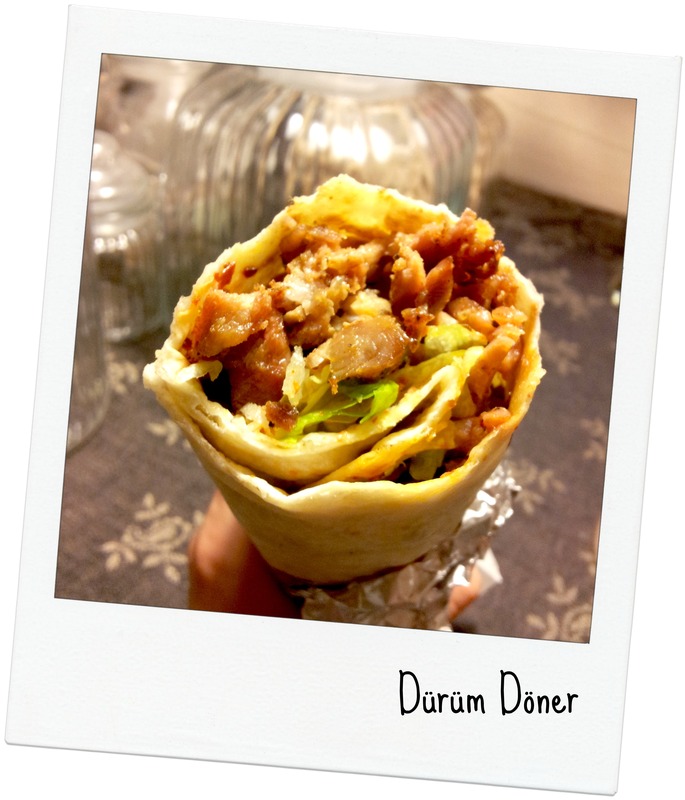 Everything looks delicious…what is a durum doner? Mmm, I love leftover steak in salads and wraps. It has been awhile since I have done that, but it looks amazing! Thank you, Laura 🙂 I hadn’t done that for a while too but I am glad I did it! It was so good! Thank you so much Sarah 🙂 For me it’s the best kind of salads! LOVE how you are the stollen in such a short time span- you are in the minority- I know people who take like, half a year to finish it! Actually I was really proud of me. I could have eaten it – no problem at all 😉 – but didn’t need it. And the next day I was thrilled that I had those lovely leftovers. I should listen to my stomach more often! 😀 I’m totally the same. I am humming christmas carols all the time. Thank you Jen! Your food looks perfectly! 😉 I too would like to arrive to the family, but I can’t because of study 🙁 I madly miss them – it seems to me, or the food is more tasty, when you with the family? Hi Marina, thank you for stopping by! I think you’re absolutely right! Everything tastes better when you’ve your beloved ones around you! Hope you see your family soon! Happy Holidays!